A little more action in terms of farmer's markets this weekend! 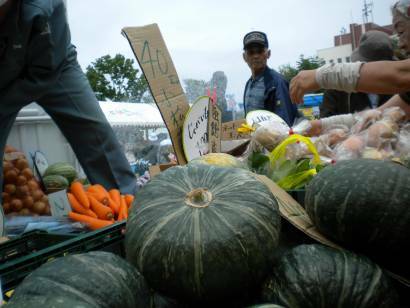 Grab a shopping bag and head on out to explore the city and get some good fresh vegetables. Remember, too, that markets are a fun place to take visitors whether from abroad or just another city in Japan. The UN University Night Market is an especially unique outing, and Kichijoji in general never disappoints. This week's photo is from our visit to Nemuro in Hokkaido. A community gathering to remember the loss of the Kuril Islands after the war and the struggle to get them back from Russia sported some local food and this vegetable truck. Nemuro is primarily a fishing area with fierce winds and unpredictable weather year-round, so gardening and farming is pretty challenging. All of the produce on this truck came from other parts of the island.